It started with an idle conversation over on Twitter. There is a social sharing game-thing doing the rounds at the moment where people post a screenshot of a favourite retro game, and then tag friends into the conversation so they can share their favourite games of yesteryear, and so on and so forth. 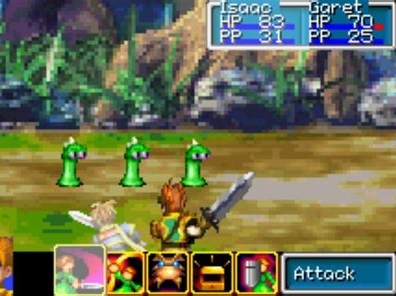 Then someone posted a screenshot of Golden Sun. One of the things I remember most about Golden Sun, a JRPG developed by Camelot (the Mario Tennis and Golf developer), and published on the Game Boy Advance, was my review of it. I was fairly new and green when I reviewed that one, and after giving it a 7/10, I met with my very first wave of the entitlement... I mean anger, that this industry so often degrades itself to. This was before the days where people could send you death threats over Twitter. It was even before comments under a story were a thing. Back in those days, if readers wanted to discuss a review, they needed to head into a website's forum and sign up there. And boy did they sign up and let me know what they thought of my review... and I published that two years after the game was released as a "second opinion" on GBACentral's first review because I did have an alternative perspective on it, so it's not like they were getting angry about a new game. And then me being me, I backed that up by giving the sequel to Golden Sun a 5/10. Yeah, I've always been a bit like that. The site that I wrote these reviews for - GBACentral, is no longer around, but thanks to the technological miracle that is the Wayback Machine, an archive for the site remains. And for the heck of it, with my memory jogged from the Twitter retro game thing, I went back to check that review and see how my writing has progressed in the years since. And that's when I noticed it. The date that review was published. April 2003. Golden Sun wasn't the first review I had ever written (I can't remember which was). I do have a vague recollection of it being one of the first, though. At the very least, regardless of what did come first, that publication date means that I've been writing game reviews for 15 years this year. Very possibly this very date. It's a long time to count, 15 years. It means that a lot of people out there that today yell at me for not being "gamer enough" because I liked a game they didn't (or didn't like a game they did) weren't even alive when I started writing about games. Given that I've never actually taken a break from writing about games (I went from GBACentral to Official PlayStation 2 Magazine, to GamePro and then DDNet), it means I've written quite literally tens of thousands of articles, reviews, and other such pieces about games. It means millions of people have read something I've written at some point in time. Truth be told, thinking about that is more than a little overwhelming. So naturally I've been getting a bit nostalgic today, and looking back at everything I've done, and my experience with games in general. That review of Golden Sun stands as proof that in some areas the games industry hasn't changed. "Gamers" threw tantrums about that review, and "gamers" continue to throw tantrums for almost the exact same thing; with the perfect case in point being the meltdown Jim Sterling copped when he gave The Legend of Zelda: Breath of the Wild a 7/10 or whatever score it was. Or indeed the near endless whining I've been getting from my review of Dynasty Warriors 9 because I had the sheer audacity to like a game other people didn't. But in other areas, games have changed so much from those early days. Digital distribution (the entire reason I set up DDNet, seven or eight years go) has allowed smaller developers and indies to thrive and indulge their creativity, unburdened by the need to find a publisher. The games industy has also become far better at being diverse and engaging with creators and communities of all genders, ethnicities, ages, and sexual orientations. It's not perfect, not by a long shot, but it's significantly better. And it's far easier to talk about games as art - my own personal preference for these things, because games have more genuine artists working on them, crafting ever deeper and more profound works. The days in which the overwhelming majority of games are effectively shallow entertainment are gone. For all the rise of esports and that nonsense - and I do, personally, find it to be a lot of nonsense - it shouldn't be forgotten that artistic-orientated games are indeed growing, evolving, and becoming ever more compelling themselves. It's that development that keeps me going. Things were different back in 2003. I was younger, of course. Much younger. My priorities in life were far different. I wasn't happily married and while I liked Final Fantasy just plenty, I didn't have my wife pushing me to learn more about Japan and really come to love my nation-in-law. In fact, my taste in games would be unrecognisable to anyone who reads my work now; I loved platformers for a start, and I was living on a student's income so what little money I had for games generally did get funnelled into the "blockbusters" of the time. Indeed, part of the reason I started writing about games was the promise of "free games." Fast forward to now and there have been any number of opportunities to get out of the industry completely. When GamePro shut down in Australia I didn't need to set up DDNet. I could have let gaming go back to being a hobby. I've developed other hobbies and interests in the years since too, and could have opted to put more time into those than continuing to write about games. But I love games. Every time I get close to the brink of giving up, something comes around to surprise and delight me. I find myself increasingly sticking to the niche and the weird, but the fact that the niche and the weird is in itself enough to sustain me, and my interest in games, is impressive. It wouldn't have been the case even a decade ago. There was so little of that stuff. I don't know if I was publishing reviews before 2003. I believe Golden Sun was close to my first. Either way, I'm counting 2003 as the first year I was writing reviews and other articles regularly, making this year my 15th of being an active games writer and critic. Sure this article has been self indulgent, but I think a 15th anniversary is an achievement worth indulging... and besides, ultimately if no one read my writing, I would have given up long ago. So I'll finish up by saying a big "thank you" to everyone who read my stuff. Overall, it has been a pleasure!